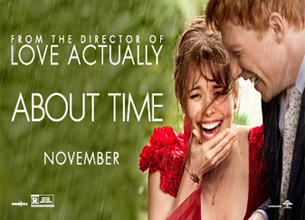 **UPDATE: New offer – Get FREE About Time Movie Screening Tickets! Get FREE About Time Movie Screening Tickets! They currently have tickets in the following locations at this time: Alaska, Arkansas, California, Colorado, Delaware, Florida, Georgia, Hawaii, Idaho, Illinois, Indiana, Louisiana, Maryland, Massachusetts, Nevada, New Hampshire, New Jersey, New Mexico, New York, North Carolina, Ohio, Oregon, Pennsylvania, South Carolina, Tennessee, Texas, Virginia, and Washington. Note: Tickets sell out fast.